To help accomplish the goal a stream restoration day is scheduled for Saturday May 18th with CWTU, FVTU and the DNR. The location will be Bird Creek in Wautoma. The site will be Bird Creek Park with the entrance on Hwy 21. There is a sign on the right side of the highway pointing to the park area. Starting time will be 8:00 AM. A usual day begins with 30 minutes to 40 minutes of information sharing from the DNR. 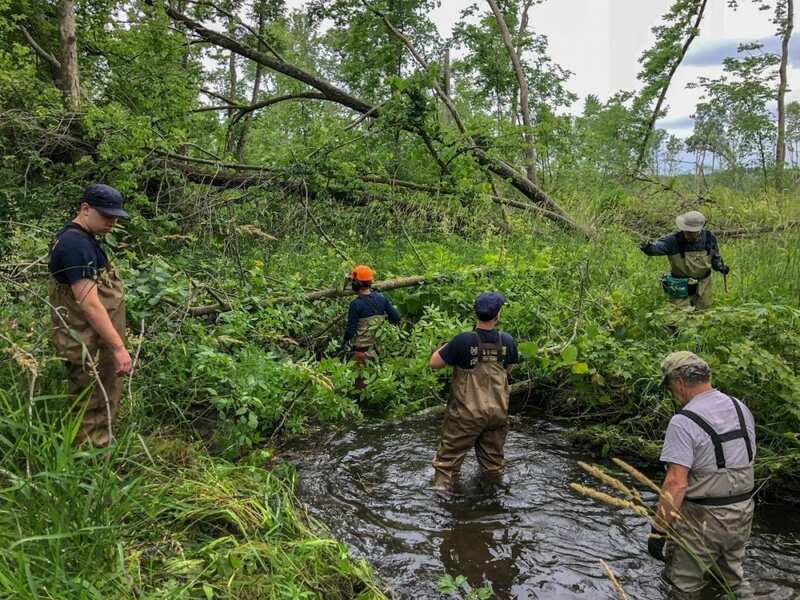 Restoration usually involves removing trees that make fishing difficult and brushing along the stream to make stream access easier. The DNR mans the chain saws and we help place the logs and brush at points in the stream to help reduce erosion and increase flow rates to wash away sand. At some locations bank covers are construction to provide a safe haven for fish to avoid predators. You are invited to attend the session along with your family including kids, friends or fishing buddies. Everybody is welcome. You can observe the activity or participate to the extent you are comfortable with. At noon a lunch will be served. After lunch casting and fishing instructions will be available for anyone interested. The benefits of attending are: enjoying the outdoors, learning new fishing spots, meeting others with similar interests plus learning more about cold water fisheries. I hope you can attend the session.